In recent years, digital communication with and between products has continually increased. This is also the case for products from Bürkert Fluid Control Systems, a leading global manufacturer of measurement, control and regulation systems for fluids and gases. The Ingelfingen-based family business was founded over 70 years ago and since then it has developed a wide variety of products and applications for fluids. The company’s technical writing department has been using our SCHEMA ST4 Component Content Management System for three years. At the last SCHEMA Conference, Gudrun Krebs-Bothner and Ingrid Eichholz from Bürkert gave a talk entitled “The Living Screenshot – Intelligent Callout Graphics”, in which they demonstrated how they use ST4 to modularise user interface text from screenshots. Bürkert products are controlled using a variety of user interfaces. All of these are documented according to the target group and country. As well as running text containing a large amount of user interface text, the documentation also contains countless screenshots with annotations. Changes to the communication software affect a large number of Bürkert devices, which quickly becomes a problem given the short update cycles of the software. 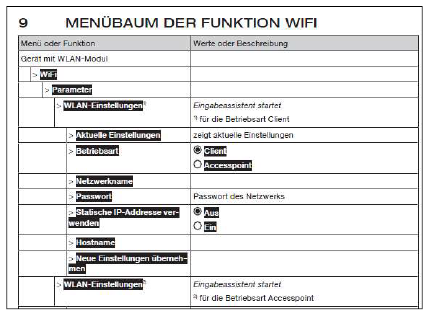 Bürkert works in three languages, which meant that for each update to user interface text, updates to at least three screenshots were also required. 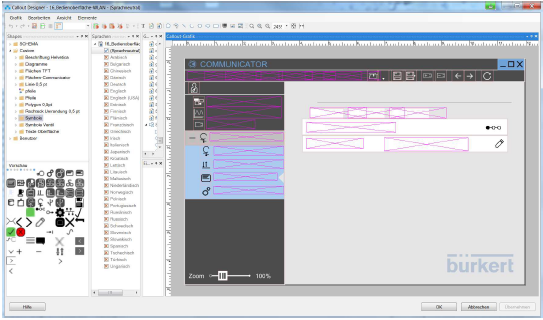 To do this, software user interfaces were manually recreated in Adobe InDesign and the relevant text inserted manually. Then the text fragments were sent for translation, after which they once again had to be manually inserted into the screenshots. A very time-consuming process. Most ST4 users are very familiar with the standard application scenario for Callout graphics: the tool is used for graphics with portions of text that need to be available in a variety of different target languages, whereby the text is language-specific in each instance. Callout Designer makes it possible to layer text on top of graphics and send just these layers for translation. The language-neutral graphic remains unaffected by the process. This eliminates unnecessary graphics editing costs from the translation agency, as they only need to translate the graphic text. Bürkert takes this standard approach even further. They collect a pool of user interface texts, which can be used for graphics as well as text nodes and text fragments. Then they connect the Callout graphics using a process that was originally designed to create dynamic tables. Want to know more? The first step is to import the user interface texts for the various products into ST4, along with other information. As the texts are in XML format, this can be performed easily using an Excel import. The result is a series of structured information in “data nodes”. The data nodes depict the functions of each product with their different attributes, such as system name or description. The user interface text is also available as a data node characteristic. The advantage of data node characteristics is that they can be referenced, making them perfect for the creation of dynamic tables. The rest seems simple once you have thought of the idea: Bürkert reconstructs the software user interfaces exclusively using Callout Designer. All of the text locations are replaced with referenced data node characteristics, as is the text itself. There are no screenshots in the usual sense of the word. changes to the user interface text only take place in one location. Text and future “screenshots” are adapted therefore at the same time. Transfer errors are a thing of the past. While the user interface text is being translated, the screenshots are also being translated at the same time. By entering the text into data nodes, Bürkert maintains maximum flexibility as far as expansion is concerned. The data nodes are filled using the Excel import; a straightforward standard process that enables structured data to be imported into and exported out of ST4 at any time. 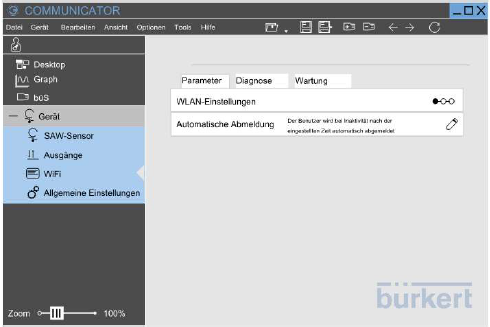 For a long time Bürkert has also been thinking about how they can display the menu tree of their device software using the imported XML files in ST4. This has now been implemented and is undergoing the final finishing touches – just the display still needs to be optimised. Who knows, maybe we’ll find out how things at Bürkert are progressing at the next SCHEMA Conference. Ingrid Eichholz studied at the Baden-Württemberg Cooperative State University Mosbach. After 15 years in the design industry, she made a career switch to the technical writing team at Bürkert in 2007. Her key activities here are creating operating instructions and terminology. Gudrun Krebs-Bothner, is a state-certified Print Technician. 1985 – 2008, she worked independently in the field of copy production/desktop publishing and from 2000 she also worked for a technical documentation service provider. In 2006, she took over the role of developing and managing the Technical Documentation Department at Bürkert.